My daughter is at an age where she is reading Middle Grade literature and is always on the lookout for a good book to read. Middle Grade books are written for kids between 8 to 12 years old with content that is age appropriate for them which means these stories are void of profanity, gore, graphic violence and sexuality; though they may contain some romantic situations such as a crush or first kiss. Examples of Middle Grade reads are Jeff Kinney's Diary of a Wimpy Kid series, the novel Wonder by R. J. Palacio, and the newest book my daughter has recently taken a liking to BEST BABYSITTERS EVER by Caroline Cala. Once upon a time, a girl named Kristy Thomas had a great idea: to form The Baby-Sitters Club with her best friends. And now in BEST BABSITTERS EVER twelve-year-old Malia Twiggs has had a great idea too. Technically, she had Kristy’s idea. 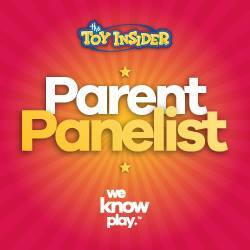 (And technically, little kids seem gross and annoying, but a paycheck is a paycheck). After a little convincing, Malia and her friends Dot and Bree start a babysitting club to earn funds for an epic birthday bash. But babysitting definitely isn’t what they thought it would be. 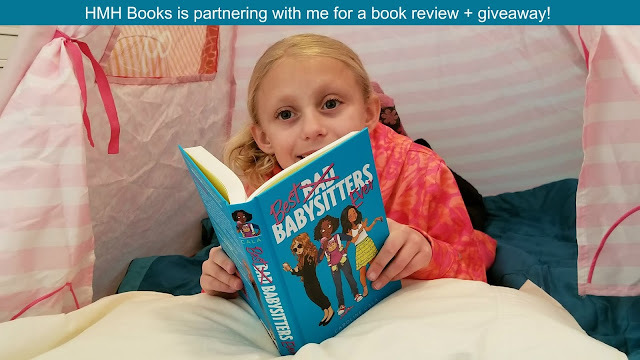 From the amount of giggling that my daughter has been doing while reading BEST BABYSITTERS EVER, obviously a lot of things do go wrong for the girls in their efforts to raise some easy cash. But these comedic situations and humorous moments are what make flipping through the pages of this book so entertaining for tweens like my own ten year old girl. 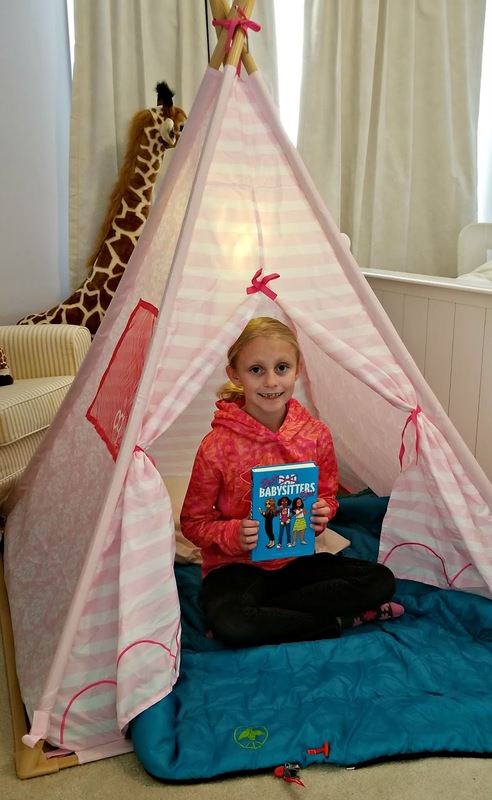 She has been camping out in her bedroom play tent having a great time reading this book ever since getting her hands on it. For some dinner time conversation, I've been asking my daughter about what is going on in the book. So our whole family has been getting regular updates about BEST BABYSITTERS EVER as she has been making her way through the story. It is nice to witness how engaged my daughter has been talking about this book with us over meals at the dining room table. You can tell she has genuinely been enjoying reading BEST BABYSITTERS EVER. From our dinner conversations, it seems as the author portrays an authentic depiction of tween aged girls friendship that makes the characters very relatable to my daughter. It seems as if this book also has a diverse cast of characters from different ethnic and socio-economic backgrounds. 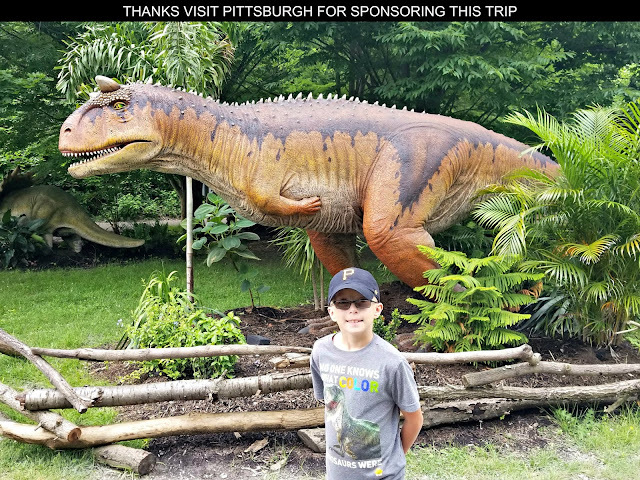 BEST BABYSITTERS EVER also has themes that promote female entrepreneurship and provide lessons for kids on how to make and spend money responsibly. In fact, my daughter has started coming up with her own business ideas to do with her friends since she started reading this book. Some of their ideas have included selling bags of popcorn to their classmates on days there are assemblies at school or glow-in-the-dark bracelets and necklaces during dances, traveling around the neighborhood on snow days offering people shoveling sidewalks and driveways hot chocolate, and running a puppy daycare. You have to admit these are some good ideas! Based upon the excitement about reading this book has generated with my daughter plus how it has sparked her creativity and imagination, BEST BABYSITTERS EVER has earned A GEEK DADDY nod of approval. You can find the book at Barnes & Noble, Books-A-Million and a number of local independent bookstores by searching the Indiebound directory. The book is published by HMH Books for Young Readers and will be available to purchase beginning February 5, 2019. Thanks to HMH Books ageekdaddy.com also is hosting a BEST BABYSITTERS EVER giveaway. 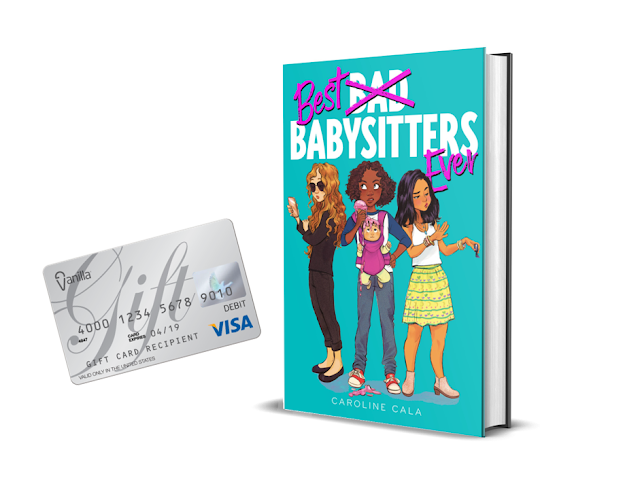 One lucky randomly selected winner will receive a copy of Caroline Cala's debut Middle Grade novel BEST BABYSITTERS EVER + a $50 Visa gift card to let your young reader splurge on themselves – no babysitting job required! To be eligible to win just complete the entries in the rafflecopter form below before 11:59 pm ET on February 4, 2019. Must be a United States resident over 18 years old to be eligible to receive this prize pack. Good luck! For more great Middle Grade book ideas for girls and boys, check out the MIDDLE GRADE MANIA website. It is full of book suggestions, fun activities, and educational resources for tween reading. You can also follow HMH Books on Twitter, Facebook and Instagram.